Posted on 2 March, 2016 at 4:05 pm. Media technology can help people who are isolated connect to the outside world in ways that can be life-changing. A change in environment, the breakdown of a relationship, poverty or mental health problems can all lead to social isolation or loneliness that can be difficult to resolve, or sometimes even to talk about. New research shows that providing people with radios, televisions or tablet computers can help them to re-engage with the world and overcome their loneliness. Loneliness is a huge problem in our society. It has been described as the ‘hidden epidemic’ of our time, and it can affect anyone at any age. Studies have shown that loneliness is as deadly as smoking cigarettes and worse for the health than obesity. This month we will reveal the results of our study on the power of media technology to relieve loneliness. Conducted in association with the University of York, the report explores the ways that technology can transform the lives of even the most isolated of people. We have been working since 1939 to provide lonely and isolated people across the country with a connection to the outside world through media technology. Over recent years there has been a shift in the public perception towards technology. Many people are concerned about The Big Disconnect; the idea that media is actually making us more antisocial and less engaged with the people around us. That rather than connecting us to others, media technology is making us more socially isolated and more unhappy. Despite the prevalence of this idea, it didn’t match with the feedback that we receive from our beneficiaries, who say that their new technology makes them more happy and feel less lonely. So we decided that we needed to find out the truth about loneliness and media technology. Last summer we commissioned researcher Dr Annie Irvine of the Social Policy Research Unit at the University of York to interview people who have benefited from our work to find out what impact media technology had on their lives. The full results will be announced at a launch event hosted by Wavelength and academics from the University of York on the 23rd March. Participants also reported that their new technology produced therapeutic effects, lifted low moods and increased their motivation to get up and go. 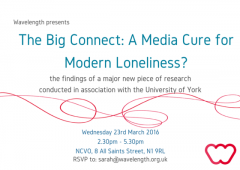 If you would like to join us on 23rd March, please email sarah@wavelength.org.uk to reserve your place.